I am so lucky to be teaching science, but I do miss the regular classroom. I use to use mentor texts in reading to tie what I needed to teach in science and social studies. 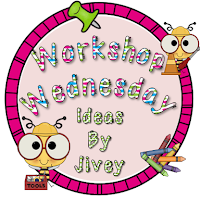 Ideas By Jivey this week uses sites that have created ideas to tie science into the classroom. That is what I get to do each week. Kinders... so cute to add...in our kinder"garden" after each page...until when we harvest...in first grade! This insect book is a great way to introduce the unit...write what they know... and then when we are done...what they learned. Check out my post below for what we did! 2nd graders are using a beautiful book that we use to learn about seeds. I have seeds in containers for us to compare and contrast. We try to guess what they will grow into and review what the book taught us about seeds. They each get a seed packet to draw the seed and what they can learn from a sleepy seed once it is in the ground. We then plant a seed. Third graders will be continuing to learn about sound and we are using this non-fiction book to review our vocabulary words: pitch and volume as well as vibration. Our fourth graders are using The Moon Book by Gail Gibbons to introduce the phases of the moon. I love the rap that we also use to incorporate song whenever possible. Mentor texts are then used to give to my classroom teachers to reread or use in the classroom or I even give my teachers other book options to use in reading and writing in the classroom. Thanks for linking up! These are fabulous books!! !